When traveling to your Beach Vacations North Myrtle Beach destination, you are embarking on a new adventure packed with endless possibilities for fun and excitement. Barefoot Resort and Yacht Club is one of the top condo rental destinations along the Grand Strand, and with expansive amenities and nearby attractions, it's no wonder that Barefoot Resorts guests continue to return year after year. While staying in one of the Barefoot Resort condos, you'll find that most, if not all, of the neighborhoods within the resort provide guests with on-site amenities like outdoor swimming pools and charcoal grills. Guests can also utilize the many basketball, tennis, and volleyball courts that can be found in many of the Barefoot Resort complexes. Perfect for warm days, these amenities give you the freedom and space to enjoy the perks of vacation. Be sure to check with the front desk agents when checking in to receive the proper pool tags or fobs for your Barefoot Resorts complex. Additionally, Barefoot guests can also take advantage of the sprawling outdoor pool found in front of the Yacht Club and North Tower high-rises. This sparkling reservoir is the largest salt-water pool in the state, and guests from all over the resort have free and unlimited access to this swimming area. 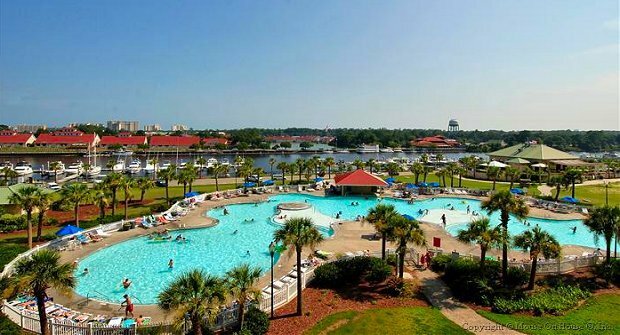 Aside from the many outdoor pools scattered throughout the Barefoot Landing Resort property, guests can visit nearby Jasmine Spa and Fitness Center for an additional cost. Be sure to let the staff there know you are a Barefoot Resort guest for a discounted offer. You will also find on-site dining options located just south of the North Tower and pool area at Barefoot Landing. Choose from Ultimate California Pizza, Greg Norman's Australian Grill, and more! The condos at Barefoot Resort also provide guests with a convenient beach shuttle service, which operates seasonally and transports visitors from their beach vacation rentals to the sandy shores of North Myrtle Beach. The shuttle runs throughout the day when in operation, so leave the car at home and enjoy the sun and salty-sea air at your leisure. If you're looking to take your Barefoot Resort vacation up a notch, visit the Barefoot Marina and variety of water sports offerings located within close proximity to the resort. Try your hand at fishing, kayaking, parasailing, and much more during your next beach getaway to North Myrtle Beach. With options like these, you may need to plan more than one trip to Barefoot Resort by Beach Vacations in order to experience it all. Enjoy the fabulous amenities found at this convenient and tranquil resort, and take advantage of all of the nearby amenities and attractions offering up unique adventures for all.